Six shots. Five dead. One heartland city thrown into a state of terror. But within hours the cops have it solved: a slam-dunk case. Except for one thing. The accused man says: You got the wrong guy. Then he says: Get Reacher for me. And sure enough, from the world he lives in--no phone, no address, no commitments--ex--military investigator Jack Reacher is coming. In Lee Child's astonishing new thriller, Reacher's arrival will change everything--about a case that isn't what it seems, about lives tangled in baffling ways, about a killer who missed one shot--and by doing so give Jack Reacher one shot at the truth....The gunman worked from a parking structure just thirty yards away--point-blank range for a trained military sniper like James Barr. His victims were in the wrong place at the wrong time. But why does Barr want Reacher at his side? There are good reasons why Reacher is the last person Barr would want to see. But when Reacher hears Barr's own words, he understands. And a slam-dunk case explodes. Soon Reacher is teamed with a young defense lawyer who is working against her D.A. father and dueling with a prosecution team that has an explosive secret of its own. Like most things Reacher has known in life, this case is a complex battlefield. But, as always, in battle, Reacher is at his best.Moving in the shadows, picking his spots, Reacher gets closer and closer to the unseen enemy who is pulling the strings. And for Reacher, the only way to take him down is to know his ruthlessness and respect his cunning--and then match him shot for shot....From the Hardcover edition. 2012-08-02. New. Ships with Tracking Number! INTERNATIONAL WORLDWIDE Shipping available. Buy with confidence, excellent customer service! 2005-03-04. New. Ships with Tracking Number! INTERNATIONAL WORLDWIDE Shipping available. Buy with confidence, excellent customer service! 2006-03-06. Good. Ships with Tracking Number! INTERNATIONAL WORLDWIDE Shipping available. May not contain Access Codes or Supplements. May be ex-library. Shipping & Handling by region. Buy with confidence, excellent customer service! 2006-01-04. New. Ships with Tracking Number! INTERNATIONAL WORLDWIDE Shipping available. Buy with confidence, excellent customer service! 2011-04-03. New. Ships with Tracking Number! INTERNATIONAL WORLDWIDE Shipping available. Buy with confidence, excellent customer service! 2006-01-06. New. Ships with Tracking Number! INTERNATIONAL WORLDWIDE Shipping available. Buy with confidence, excellent customer service! 2009-05-06. New. Ships with Tracking Number! INTERNATIONAL WORLDWIDE Shipping available. Buy with confidence, excellent customer service! Random House Large Print, 2005-06-21. Hardcover. Used:Good. Bantam Press, 2005-01-01. Paperback. Used:Good. Delacorte Press. Hardcover. 0385336683 New Condition *** Right Off the Shelf | Ships within 2 Business Days ~~~ Customer Service Is Our Top Priority! - Thank you for LOOKING :-) . New. Very good in very good dust jacket. Signed by author. first print. Signed in person by author on the full title page, not inscribed, clipped or otherwise marked. London: Bantam, 2005. the true first edition a collectible copy. Signed By the Author. First UK Edition. Hardback. Fine/Fine. Hardcover. NY: DELACORTE.. Fine. 2005. First Edition. ADVANCE READING COPY. Fine in pictorial printed wrappers. (Publicity release from the publisher to a reviewer laid-in) Basis for the recent film adaptation "Jack Reacher." . Delacorte. PAPERBACK. 0593054113 New Condition. . New. Delacorte Press. Hardcover. 0385336683 New Condition. . New. Transworld Pub. Hardcover. 0593051831 New Condition. . New. Bantam Press. Hardback. Fine/Fine. 2005. Hardback. Fine first edition first print in fine dust jacket protected with Mylar cover. 2012-08-02. Good. Ships with Tracking Number! INTERNATIONAL WORLDWIDE Shipping available. May not contain Access Codes or Supplements. May be ex-library. Shipping & Handling by region. Buy with confidence, excellent customer service! London: Bantam Press, 2005 Book. Near Fine. Hardcover. Signed by Author(s). 1st Edition. 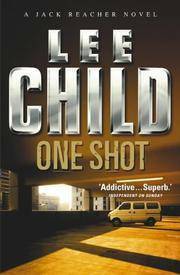 pp 363 A signed first edition of Lee Child's Jack Reacher novel, One Shot. The book is fine in black boards in the gold, brown and white photographic dustjacket. Recently filmed for the first time starring Tom Cruise, Child's novels continue to grow in popularity by the week. Please contact Christian White at Modernfirsteditions if you would like more information about this book..
Delacorte Press. Hardcover. 0385336683 Please allow 4 - 14 business days for Standard shipping, within the US. Thank you for supporting our small, family-owned business! . New. 2005-06-14. 1st. Delacorte Press. Hardcover. 0385336683 Please allow 4 - 14 business days for Standard shipping, within the US. Thank you for supporting our small, family-owned business! . Fine. 2005-06-14. 1st. U.S.A.: Delacorte Press, 2005. Book. Very Good+. Hardcover. Signed by Author(s). 1ST. A Very Good Copy - Signed By The Author On The Title Page. First Edition, First Printing. Book Is In Very Good + Condition. Boards Are Clean, Not Bumped. Fore Edges Have A Small Amount Of Shelf Wear. Interior Is Clean And Legible. Not Remaindered. Dust Jacket Is In Very Good + Condition. Tiny Bit Of Edge Wear, Tiny Bit Of Crinkle. Not Price Clipped. Dust Jacket Is Covered By Mylar Wrapper. Thanks And Enjoy..
New York, New York, U.S.A.: Delacorte Pr, 2005 Fine in a near fine dust jacket. First edition as indicated by the full number line on the copyright page 10 9 8 7 6 5 4 3 2 1. Original price of $25.00 printed on front flap of dust jacket.. 1st Edition. Hardcover. Fine/Near Fine. Transworld Pub. Hardcover. 0593051831 British first edition, first printing. Contains number line 1 2 3 4 5 6 7 8 9 10. Virtually no wear to jacket. Jacket is in a Mylar cover. Jacket is NOT price clipped. Covers are clean and bright. Edges are sharp. No tears or creases. The book itself is in Near Fine condition. The binding is straight and tight. Pages are browning. No remainder mark. All books are marked down 35% until February 1, 2019. Start stocking up now! . Fine. 0 First Edition/First printing. Signed by Lee Child directly to Title page. Published by Bantam, London 2005. Book is in Nr Fine clean and bright condition. Dustjacket not price clipped. Slight Spotting/Toning to page edges. Dell Pub Co, 2006-03-31. Floor Disp. Paperback. Good. New York: Delacorte Press, 2005. First Edition. First Printing Number line. Inscribed and signed on title page. In red paper covered boards and black paper spine with copper lettering. Square and iontact binding.. Clean and unmarked endpapers and text pages. Very small light stain on upper edge. Jacket: Intact with price on upper front flap. Light shelf rubbing. In new protective jacket cover. Photos upon request. . Signed by Author. Hardcover. Very Good/Very Good. 8vo - over 7¾" - 9¾" tall. New York:: Delacorte,, (2005.). Fine in copper foil and red wrappers. A relatively uncommon advance issue, especially in this condition. Publisher's letter laid in. . Advance Reading Copy (trade paperback format. ) Novel in the award winning series featuring Jack Reacher novel: Reacher, an ex-military cop, the ultimate loner and afraid of nothing. Basis for the 2012 movie 'Jack Reacher.' SIGNED on the title page. 376 pp. New York: Delacorte Pr. Fine in Fine dust jacket. 2005. First Edition; First Printing. Hardcover. 9780385336680 . No Priority shipping. International orders may require additional postage. ; Jack Reacher #9 . NEW YORK: DELACORTE PRESS. VG IN WRAPS. ADVANCE READING COPY, SIGNED BY AUTHOR. Pages: 377. . 2005. TRADE PAPERBACK.. PAGES CLEAN, BINDING TIGHT. . Condition: VG IN WRAPS. ADVANCE READING COPY, SIGNED BY AUTHOR. Pages: 377. U.S.A.: Delacorte Press, 2005 A fine copy in a near fine dust jacket. SIGNED by the author on the title page. First edition, first printing as indicated by the full number line on the copyright page 10 9 8 7 6 5 4 3 2 1. Original price of $25.00 printed on the front flap of the dust jacket.. Signed by Author(s). 1st Edition. Hardcover. Fine/Near Fine. 2005-03-04. Good. Ships with Tracking Number! INTERNATIONAL WORLDWIDE Shipping available. May not contain Access Codes or Supplements. May be ex-library. Shipping & Handling by region. Buy with confidence, excellent customer service! Brilliance Corporation. Used - Good. Former Library book. Shows some signs of wear, and may have some markings on the inside. Dell. Mass Market Paperback. 0345538196 Please allow 4 - 14 business days for Standard shipping, within the US. Thank you for supporting our small, family-owned business! . New. 2012-11-06. Dell. Mass Market Paperback. 0345538196 Please allow 4 - 14 business days for Standard shipping, within the US. Thank you for supporting our small, family-owned business! . Fine. 2012-11-06. Transworld Pub. Hardcover. 0593051831 Like New Condition. . Fine.